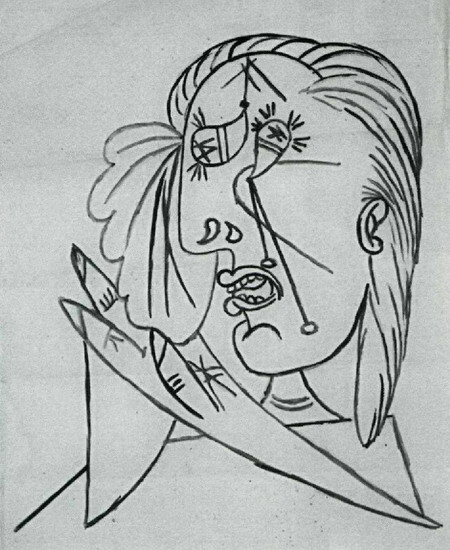 Pablo Picasso: Yes, even the girl who interviewed me for I do not know what newspaper, I told her: "Ah, you know, for me, only love counts, is not it ? " -P.P. : Everyone, I loved passionately, and I even think I would like a door knob, a chamber pot, whatever. RTBF-: do you like TV? -P.P. : I have it. I started a day because there was the wedding of Princess Margaret. Someone loaned me a TV and I saw the parade of the princess. And I kept the television and I continued to watch. -RTBF: what would be great when you were on camera, this would leave you alone release. You would be so capable of doing great things for viewers and you would invent news things for them? -P.P. probably. Sometimes I find wonderful things on TV, very nice things I like and that interest me. But sometimes it's terrible things. I say this because we are both here alone. Ah, this is not true, because everybody listens! -RTFB: If you had to choose yourself the time, the paint, the canvas which should you survive, what is this painting, that period? -P.P. I do not know. It's difficult. Done so with the intentions of the moment, the time and the state in which everyone and myself we are. It's difficult. At the time of Guernica, Guernica I did because it was a great disaster, even the beginning of many others that we followed. But finally, it is. It's personal. Basically, these are the memories that everyone writes.